The Great Dane is known for being tall. 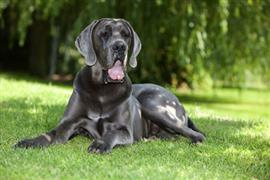 Towering above most other breeds has landed many Great Danes with height related names. Good ideas can come from highest peaks, tallest basketball stars, and biggest roller coasters. A few names related to tall peaks in the United States include McKinley (tallest in Alaska and all of the US), Whitney (tallest in California), Elbert (tallest in Colorado), and Rainier (tallest in Washington). Other names can be borrowed from some of the tallest NBA stars like Manute Bol (7’7), Shawn Bradley (7’6), and Yao Ming (7’6). Colossos, Toro, and Cyclone are names taken from some of the tallest wooden roller coasters in the world. Although the Great Dane is a very tall breed, it manages itself well. Sometimes being tall leads to clumsiness, but the Great Dane is a strong and stout breed. Rattling off a few words describing a Great Dane will leave anyone sounding like a truck commercial. A few names taken from rugged, dependable, and powerful trucks include Ram, Dodge, Titan, and Sierra. Other fun names can be taken from characters on a favorite television series. Boss, Daisy, Duke, Bo, and Luke are a few options from ‘The Dukes of Hazzard’. McCoy, Kirk, Hadley, and Spock are few choices borrowed from ‘Star Trek’. Some of our pages will contain a subcategory. A subcategory is a slightly more specific grouping than the main topic of the page. For a subcategory, we will include a separated table of names and corresponding descriptions. An example of a subcategory of Red Dog Names would be 'Dog Names Inspired by Red Wines'. If you have any subcategory ideas for the Great Dane Names page, we would love to hear them. Use the form below to submit your ideas.